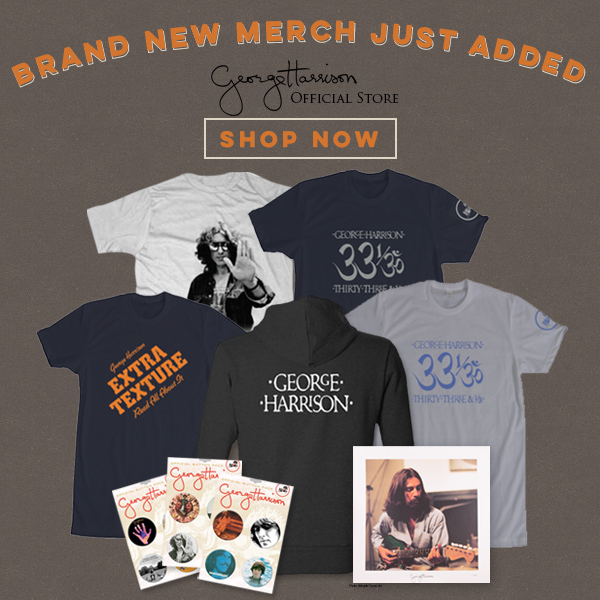 ANNOUNCING A BRAND NEW RANGE OF MERCHANDISE AVAILABLE EXCLUSIVELY FROM THE OFFICIAL GEORGE HARRISON STORE! Four new t-shirt designs, a hoodie, a range of pin badge sets plus a numbered & limited edition lithograph are now available. The lithographs feature George during a recording session at The Radha Krishna Temple in 1969 and have been printed onto the highest quality 270 GSM uncoated paper and hand numbered by a professional scribe in pencil out of only 200 prints.